The perfect getaway highly recommended for cleanliness and comfort. Perched on one of Waitarere's highest points, this bach offers you super views, comfortable beds, and a well resourced kitchen. Freshly laundered towels and sheets are ready for your use. This bach is cool in the summer and cozy in the winter with a collection of games and dvds for 'inside time'. The expansive deck has gates at both ends to keep young children safe. NB: All quotes will be adjusted to the lower price of $10 per night for ‘extra’ children aged 10 and under. A few minutes of easy walking will take you to Waitarere's magnificent shoreline. Hunger busters: you will get seriously good food and friendly service at Brittaz takeways. The local 4-square dairy sells a variety of hot food and pastries, as well as freshly baked bread and roast chicken on weekends. In the same complex you will find 'At the Beach Cafe' which opens in time for breakfast. Not far from the beach entrance you will also find local restaurant, Pipi Point, with bar and takeaways. Please clean the bbq after use, take your rubbish with you and leave property in tidy condition. We have listed our lovely property as a holiday rental for over two years and have only good things to say about this experience. 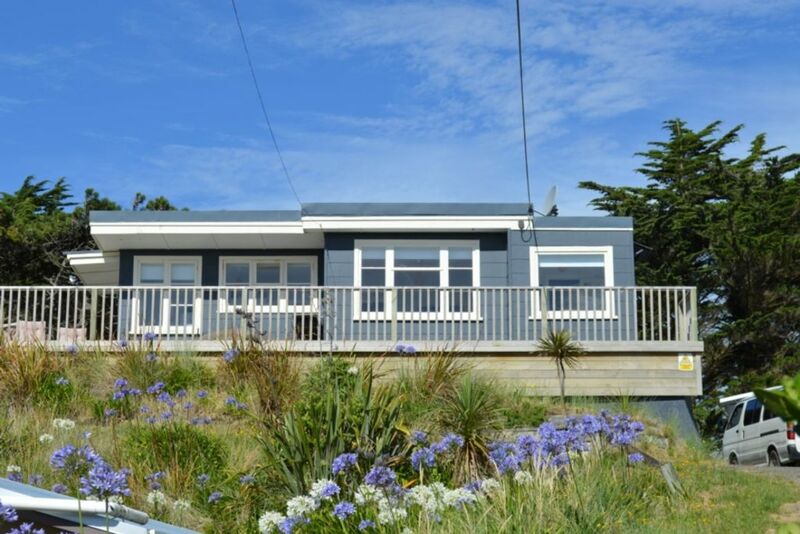 Highview is also listed on Trademe's 'Holiday Houses' Ref #: 71153 We can be easily contacted to answer any questions you may have. Highview is a feel-good place to stay, and we hope you enjoy it as much as we do. Thankyou for your interest. View over village out to sea. Large deck gated at both ends. Loved the easy chairs after a busy day. Nice views from the deck. Would stay again. We have so loved staying at this bach as it reminds us of all the holidays we had as children. It is clean and well organised with everything you need for an enjoyable stay. Lovely view from the large deck where we had all our meals. Our friends from Auckland who were staying with us also were very impressed and now want to move to Waitarere!! allowing us a later leaving time. Many thanks and we will be booking again...very positive experience all round. A great Bach in a great location. We enjoyed the views from the deck and the walks along the beach and in the forest. Perfect place to stay for a relaxing break. Great location and view from deck. Bach was light and bright and very comfortable. Great location, so restful and comfortable. We loved every moment of our stay at such a lovely clean Bach. Watching the sunsets from the deck while sipping Wairarapa wine ticked the box for us. Not too far to walk to the beach or the shops where people are so friendly. We will definitely be back.